The plants and seeds made it into the ground two weeks ago and we just can’t contain our excitement. So much so that we forgot to write about the process. But we did document it with photos. Here’s what we ended up planting: roma tomatoes, cherry tomatoes, grape tomatoes, green onions, summer squash, radishes, jalapeno, green peppers, yellow peppers, basil, cilantro, parsley, cucumber, beets, buttercrunch lettuce, arugula, snow peas, and sweet peas! 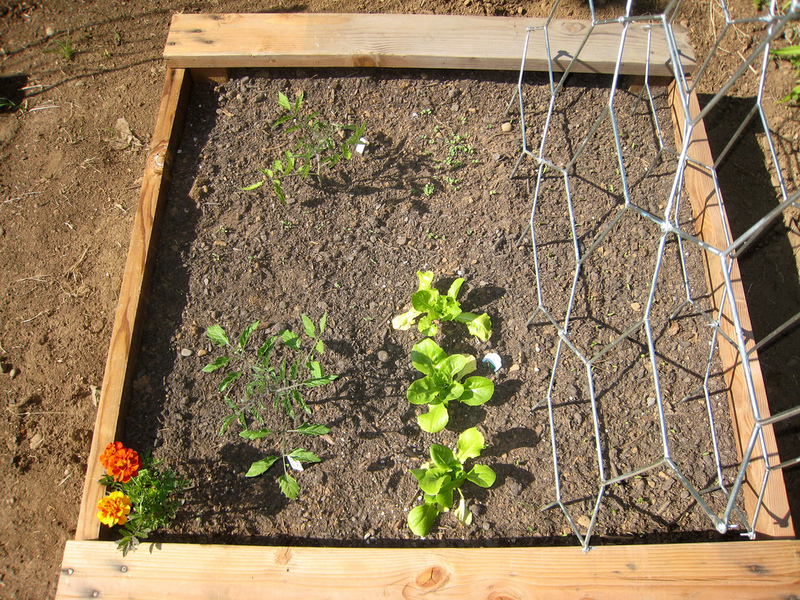 The following are pictures of one of the three planter boxes. Week 1: Sweet peas, beets, and arugula germinated! Week 2: Sweet peas and arugula growing like crazy! We edited the original container garden plan slightly to allow for the peas to grow in a north – south line and make the most of the space. As you can see in the above pics, the pea trellis is pretty tall and we’re hoping a wild wind doesn’t take it down (fingers crossed). Our latest gardening dilemma is how often and how much to water. We are currently watering every other day, by putting the hose into each box for about 2 – 3 minutes.